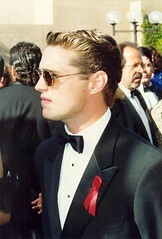 Jason Priestley, one of 1991 and 1992’s People magazine 50 Most Beautiful People in the World, is most famous for his stint as Brandon Walsh in the Fox hit series Beverly Hills, 90210 from 1990 to 1998. A professional racer as well, the Vancouver boy almost died in a practice run in August 2002 in the Kentucky Speedway. His car crashed at almost 180 mph. Beautiful person though he may have been, the Vancouver Metroblogging team, after gruelling hours arguing the merits of various Vancouver alumni, opted instead to put David Suzuki and Terry Fox among our seven gifts to the world. Sorry, Jason. We promise you’ll be our 2007 gift to the world. Originally uploaded by Elan Photography. For the past seven days, the Metroblogging sites around the globe have been unveiling seven gifts their cities can share with the world – one gift a day for seven days. Joe Sakic was one of the gifts that didn’t quite make the cut. I’ve seen Joe Sakic [wp] play in person, and on television he’s always amazing. There’s something about the way a great player can change the momentum of a hockey game that needs to be seen to be believed, and Joe Sakic is a great player. If he had not come of age in an NHL still remembering Gretzky’s glory days and Mario’s brilliance then we would have seen that sooner. A one team player he moved with the Nordiques to Denver when they became the Avalanche and along with former Canadiens goaltender Patrick Roy changed the NHL. They showed that a relocated franchise could thrive in a non-hockey environment and built inroads into America while building a franchise. He was a vital part of bringing the Olympic Gold to Canada (the tournament’s MVP), and has been a mainstay in any of our national team and the NHL All-Star Teams. He’s the highest scoring active player in the NHL, and still has the ability to take over a game and make it his. History will put Sakic in the upper end of the top players ever to play. He’s the best player Vancouver’s ever birthed and something for even the most die hard Canucks fan to be proud of. For the next seven days, the Metroblogging sites around the globe will be unveiling seven gifts their cities can share with the world – one gift a day for seven days. Metroblogging Vancouver’s Sixth Gift is Terry Fox. For anyone who’s gone to school in Canada and especially here in the Vancouver area, we are all familiar with the legacy that is Terry Fox. For some who may not be familiar with the name, he is arguably the greatest Canadian hero of the 20th century. His determination for achieving his dream has been an inspiration to many and has brought hope and smiles to people worldwide. Terrance Stanley Fox was born on July 28, 1958 in Winnipeg, MB and along with his family moved to Port Coquitlam, BC in 1966. Terry was studying Kinesiology at Simon Fraser University when he discovered he had a tumor in his right leg. As a result it was amputated six inches above his knee and he was fitted with a prostetheic leg. It was while he was recovering that he learned about a one-legged athelete who had run the New York Marathon, and with that was inspired to run across Canada to raise money for cancer research. Santa Ivan says it’s, “that special time of year when Santa’s helpers gather to rend, tear, saw, cut, fold, spindle and otherwise mutilate boring old toys, then patch, splice, glue, hammer, nail, sew and seal them back together in MUTANTOUS COMBINATIONS! The wonderful, twisted toyspawn that result are then thrust into the glad hands of HIDEOUS CHILDREN and DRUNKEN FRAT BOYS during Santarchy. For the next seven days, the Metroblogging sites around the globe will be unveiling seven gifts their cities can share with the world – one gift a day for seven days. Metroblogging Vancouver’s Fourth Gift is David Suzuki [wiki]. I know this man from the clips of his TV series our science teacher used to play in elementary school. His program on the CBC, The Nature of Things is one of Canada’s longest running, most award-winning and well respected but his achievements go far beyond the realm of Canadian television. David Suzuki was born in Vancouver in 1936. During the second world war, his family was forced out of the city and to a remote location in the interior of BC as a part of the Japanese Internment [wiki]. As David himself was 3rd generation Japanese-Canadian and could barely speak a lick of Japanese, he was also discriminated against by others in the internment camp. His family would have to stay until the war ended (3 years later), then they were forced to leave BC and head East of the Rockies – it was that or head back to Japan, a nation that Suzuki was not familiar with, Vancouver was his home. He spent the rest of his childhood years in London, Ontario and after University, Suzuki returned to Vancouver where he became a professor at the University of British Columbia in 1963. Only a few years later he would embark on a broadcasting career that would span decades, reach millions, and impact well, the planet really. He hosted various radio programs until The Nature of Things came to fruition in 1979. Since then, aside from writing books, traveling the world and raising awareness for global ecological causes, he’s created the David Suzuki Foundation. In the beginning was the mud. And it was a mess. 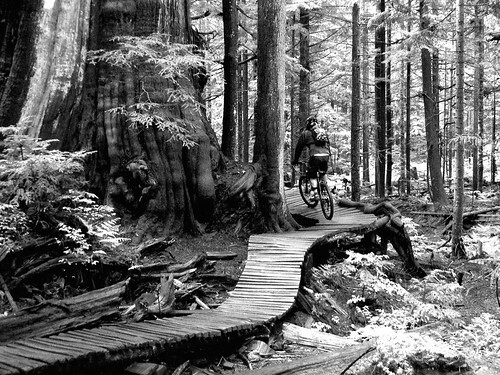 From that simple fact of life among North Shore trails was born a revolution in mountain biking: freeriding. For the next seven days, the Metroblogging sites around the globe will be unveiling seven gifts their cities can share with the world – one gift a day for seven days. Metroblogging Vancouver’s second gift is Green Peace [gp]. Greenpeace is an independent, campaigning organisation which uses non-violent, creative confrontation to expose global environmental problems, and to force solutions for a green and peaceful future. Greenpeace’s goal is to ensure the ability of the earth to nurture life in all its diversity. In 1971 the enviroment was not really the issue it is today. Whereas today we argue about climate change and worry about the hole in the ozone layer back then the majority of enviromental issues tended to focus on the Theodore Roosevelt style natural conservation (we want natural areas protected because they’re pretty and it gives us a place to shoot bears) as opposed to what we have to day when we’re facing the very real need to save the world from our waste and consumption. Started as a way to protest and stop nuclear testing Green Peace was formed in Vancouver in 1971 and then expanded to protesting whaling. The fact that very few major industrial nations whale any longer can be seen as a major victory for the group. The fact that the dangers of nuclear waste and radiation as well as the issues of “global warming, ancient forest destruction, Nuclear power, and genetic engineering” [wp] are all issues that thanks to Green Peace we are aware of. I mean Kirk and Spock went back in time to save whales [wp] in part because of the awarness created by Green Peace. Green Peace has since out grown its Vancouver roots and its headquarters are now in Amsterdam, but it started here and with it began a new era of enviromental awarness across the globe. For all of Vancouver’s gifts to the world just click here.